Hiking the GST – What does the public think? Over the last few months, our national media have been keeping score as the Liberal government unwinds former prime minister Stephen Harper’s policies. The list is long – the return of the long-form census, the expedited settlement of tens of thousands of Syrian refugees, the commitment to an inquiry for missing and murdered Indigenous women, and the mission change in the fight against ISIL, to name a few. Yet the biggest Harper legacy item of them all, the lowering of the goods and services tax (GST) by two percentage points to 5 percent, still feels like the unwanted in-law at the family reunion. A number of prominent commentators, including Chantal Hebert, Paul Wells and former prime minister Brian Mulroney’s chief of staff Stanley Hartt, have all speculated whether the Liberal government will eventually raise the GST back to 7 percent. Government spokespeople have repeatedly ruled out a GST increase, but this hasn’t stopped the Conservatives from sending out fundraising letters on the subject. In the lead up to the last election, the Conservatives were certain they had locked the NDP and Liberals into a tight fiscal trap. They believed neither party would run on a platform requiring a deficit or advocating significant tax increases. Both parties would therefore be denied the opportunity to promise popular but costly programs attractive to voters. That modest-deficit promise was soon overtaken by the weakening price of oil and tepid growth after the election. Finance Minister Bill Morneau has projected a $23 billion deficit (plus a $6 billion contingency), while the Parliamentary Budget Officer estimates the deficit will be $20.5 billion. With each GST point now worth about $7 billion, it’s easy to see how attractive a GST hike might be from a revenue perspective. But how does the Canadian public feel? In late April, H+K Strategies conducted a national survey to find out. 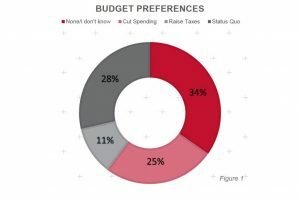 The numbers show that Canadians are fairly divided about the path that the federal government should take over the next few years when it comes to public finances and program spending, but tax increases and the GST would face an uphill battle for support. When faced with the recent budget projections, we found that about 1 in 4 Canadians opts for “cutting spending on programs and services to reduce budget deficits,” and about the same proportion favours the status quo (“leave taxes, programs/services and deficits as planned in the recent budget”). Only about 1 in 10, however, would like to see the government “raise taxes in order to reduce budget deficits and maintain programs and services.” The research also points to the unpalatability of all three of these choices: fully 1 in 3 Canadians select “None of the above” or “Don’t know” in response to this question. Most importantly, only 23 percent of Canadians support restoring the 7 percent GST, while opposition to an increase is close to three times this level, at 64 percent. Furthermore, the intensity of the opposition dwarfs the intensity of support. While there is consistency in the views of Canadians across demographic segments of the population on both questions, opinions differ significantly based on voting intention. Conservatives are much more likely to opt for spending cuts (49 percent), compared with supporters of the New Democratic Party (21 percent), Liberal Party (16 percent), Green Party (13 percent) and Bloc Québécois (21 percent). The status quo is most popular among Liberal supporters (45 percent) and least popular among Conservative supporters (13 percent). Conservatives are most opposed returning the GST to 7 percent (85 percent), followed by Bloquistes (82 percent) Greens (70 percent), New Democrats (60 percent), and Liberals (46 percent). Our research shows that Canadians are not sure what to think about the current state of federal finances, which makes it difficult for the government to obtain public support for any particular course of action. Recall that when former prime ministers Jean Chrétien and Paul Martin began bringing the federal deficit under control during the early 1990s, there was broad public consensus that spending cuts were necessary. But it took years of messaging, beginning in the late 1980s under Mulroney, coupled with well-publicized warnings from the international business media about the humiliating prospects of a “Canadian peso,” for public opinion to come around. Another hurdle for the Liberal government is that the GST is a regressive tax: the rich pay the same as the middle class, notwithstanding GST rebates for lower-income earners. If nothing else, this measure is ideologically inconvenient for the Liberal Party, which appears to have displaced the NDP from the left end of Canada’s political spectrum. It must be said the politics of the GST has proven challenging for the Liberals and the Conservatives alike. Clearly, increasing the revenue side with a GST increase would not be easy but, as we know, a week in politics is a lifetime. But then, Trudeau has become known for surprises and exceeding expectations. As an example of this, in the Liberal leader’s infrastructure announcement in Oakville during the campaign, the photo op was of Trudeau operating a heavy crane. He rejected a briefing from a local operator, with the revelation that he already knew how to run a crane. As a couple of hundred supporters and the national media looked on, he then calmly executed a series of manoeuvres. After passing his test, he performed some tricks swinging the huge hook in the air as the crowd egged him on. Who knows, if we see Trudeau sitting in a crane cab practising his moves again, perhaps he’s preparing to announce something big.